Happy Anniversary to all you readers as the Recruiting Roundup turns one! If you haven’t yet, join the 1,300+ Twitter followers of @CFRecruitingHQ. *** Iowa State and Kansas visited Cam’Ron Fletcher (St. Louis, Mo.) this week, according to Jake Weingarten of stockrisers.com. The Cyclones offered the No. 42 player in the class of 2020 back on August 7th. *** Point guard Ty Berry (Newton, Kan.) recently told HoopFocus that Iowa, Iowa State, Purdue and Wichita State are the schools recruiting him the hardest. Berry visited for the Oklahoma football game in September and was offered on October 24th. *** It’s only been a week, but TE Skylar Loving-Black (San Jose, Calif.) made another huge jump in the 247 Composite rankings. He is up 16 slots to No. 49 at the position and 339 spots overall. My math tells me that is a 754 spot climb in two weeks to sit at No. 1102 nationally. *** New name for 2019, safety Isheem Young (Philadelphia, Pa.) announced via Twitter that he is taking an official visit to Iowa State this weekend. Rated as the No. 50 safety and No. 608 overall in the class, Young holds 24 power conference offers. *** A recent 2019 wide receiver offer put Iowa State in his top five. Alante Brown (Chicago, Ill.) announced via Twitter that the Cyclones made his list, along with Florida State, Pittsburgh, Tennessee and Texas Tech. He was offered on January 12th and visited FSU officially last weekend. *** Head coach Matt Campbell and offensive line coach Jeff Myers went on the road to visit top lineman target Hayden Pauls (Emporia, Kan.). Pauls returned the favor Thursday and made his fifth visit since being offered on his first at a camp in June. He holds offers from Iowa, Kansas, Kansas State, Minnesota, Nebraska and Purdue. *** Offensive guard Marcus Harper II (Flossmoor, Ill.) will visit Iowa State this weekend. 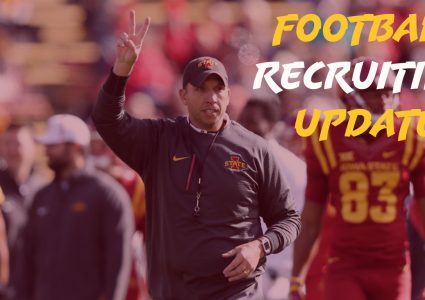 The Cyclones joined offers for the 2020 target from CMU, Cincinnati, Temple and WMU on January 18th. *** A couple in-state 2020 prospects will be in Ames on return visits this weekend. Linebacker Ethan Hurkett (Cedar Rapids) will take his third visit to Ames after visiting for games on September 15th and December 1st. Running back Creighton Mitchell (West Des Moines) will add two more visits to his previous seven visits dating back to June of 2018, this weekend and again on March 9th. 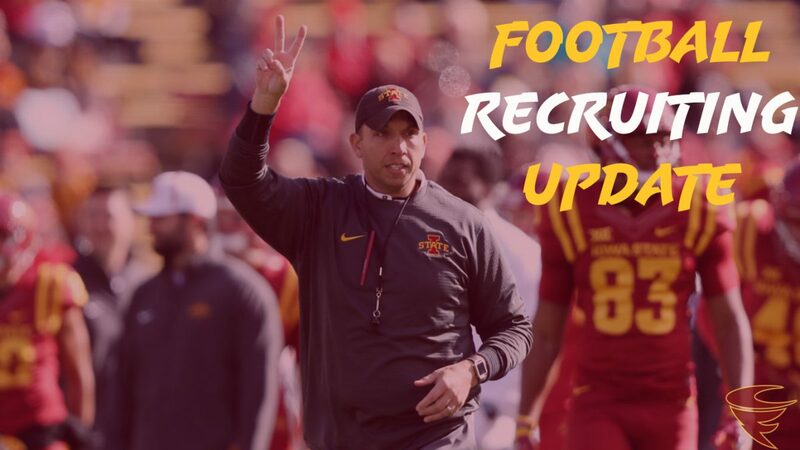 *** Iowa State handed out 18 new offers for 2020, five for 2021 and two for 2022. You can see the list and profile links in the summary below. The breakdown by state is Missouri (9), Michigan (5), Oklahoma (4), Ohio (3), Illinois (2), Florida (1) and Minnesota (1). Nate has been covering football and basketball recruiting since late 2016. He works as a software engineer for the oil and gas industry. Outside of his recruiting obsession, he enjoys spending time with his wife Lizy and son Jaxson, watching any NCAA basketball game and the USMNT, playing video games and card games. Lover of rabbits.